1. No Spamming!!!!! if you just post lots of buy this or post a lot of stuff that doesn't have anything to do with Team Aardwolf or Wolf3d Addons, Mods, etc... you will be banned. Posting stuff that doesn't have to do with Wolf3d Addons or Team Aardwolf projects belongs in the Off-topic section of the forums. 2. Treat others how you want to be treated. If you talk down to someone on the forums you will get a warning. do it over and over you will be banned. you can say that you disagree or that such and such has already happened but you cannot talk down to people at all. 3. Team Aardwolf is a bunch of hard working guys that love making wolf3d mods and sometimes we may run out of ideas. You can submitt an idea in the Idea section of the forum and we would like everyone to submitt an idea. If your idea is liked enough by Team Aardwolf to make an addon based on it you will need to contact one of the members and share your vision and what you think the game should look like. We will credit you and you will get to be the first beta tester of the mod. 4. From time to time there may be contests like who can take the best screenshot or level contests. From time to time we may have a contest to see who can create the best songs(level,title,menu songs etc...). Keep your eyes peeled for new contests. 5. If you make something for a Team Aardwolf mod and are not a part of Team Aardwolf we will still take what you have made weither it be a song, some graphics or a level. It may not be used but if it is we will give you credit. Please send a Private Message to the Admin so that the team can look at what you have made. 6. If you become a member of the forum and do not post at all or do not post much we still like having you but we would like if people posted so that we know what they think of how our projects are going. 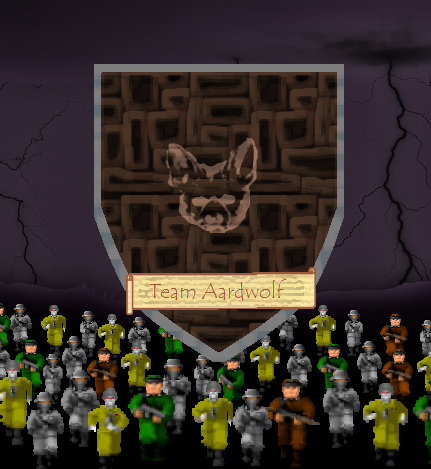 Thanks for Joining the Team Aardwolf forums! We hope you enjoy your stay on the forums!